"The Germans devoted great attention to the displacement and stability of the Bismarck and Tirpitz. They recognized the need to provide great initial stability, with commensurate resistance to large lists after side compartments were damaged. A disadvantage of this stability was the short rolling period resulting from the large GM. The Bismarck was a lively gun platform and the ship's general behavior at sea was probably rather unpleasant, particularly in following seas, where rolling and yawing motions are coupled. The Bismarck had excessive stability in many respects in that her GM exceeded the "good design practice" standard for GM (at last 5%, but no more than 10%) of the beam. Too much stability results in an unduly "stiff" ship with somewhat unpleasant rolling characteristics which tend to degrade weapon's systems effectiveness." "Of special interest is the fact that, in comparison with most large warships of the period, her beam was relatively wide in proportion to her length. 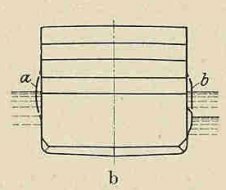 This characteristic ran counter to the prevalent desire for more speed, which called for the least beam possible in relation to length. However, Bismarck’s wide beam seemed to work to her overall advantage, because it lessened any tendency to roll in a seaway and, thus, increased her value as a gun platform." Stability and steadiness are two different things--not just different, but antithetical. A ship that is very stable will quickly recover from its roll, a relatively violent movement that can be too much for the fire-control equipment and personnel to compensate for. The Baron was not a naval architect, so his observation that a certain behavior might stem from a certain cause is not necessarily correct. What he knew was that Bismarck's seaworthiness was much better than, say, Scharnhorst's. It is difficult to design a ship that is both steady and stable. There are some solutions like bilge keels (which Bismarck had) and roll tanks (which Bismarck did not have). Thanks, I understand the point now, but I think that how this affected the Bismarck is debatable. In the Denmark Strait where the seas were high and Bismarck's short rolling period "supposedly" would be a disadvantage, the Hood was quickly straddled with the first salvos. You are right Müllenheim-Rechberg was not a naval architect, but since he was in command of a fire control station, he must have known if the ship's behavior at sea was not adequate or if it affected the personnel under his command operating the fire control equipment, and the Baron never complained about this. On the contrary, he praises the ship. Yes, it certainly is debatable. Unfortunately we lack any basis for an objective comparison of specific ships across international lines. The British may compare their own ships--apparently the "R" class was designed with less stability than Queen Elizabeth specifically for gunnery (and other) reasons--but how do we know whether American/Japanese/German/Italian ships match British standards. That's why I mention only Scharnhorst in comparison to Bismarck as a platform. All we can do is look for indicative features and say what behaviors usually accompany those features. How to evaluate the estimated motions and accelerations for a crew is still not clear, though there are graphs indicating at what frequency and amplitude of motion people tend to get sick. My own width is excessively narrow, so I'll apply that to "we" as well. I'll bet a designer back then would have given his right arm (or at least someone else's) for a modern computer. But if they could have seen from drawings what a ship's roll behavior would be, there would not have been any ships with unpleasant rolls. Do we know with a degree of certainity, that an active stabilzation system wasn't used? I haven't seen anything indicating active roll compensation. I've read a naval architect's article written shortly after the war by a Naval Tech Mission officer indicating the active system in PE but not in larger ships. A few months ago I would have said: "no it wasn't used." However, now I'm less sure. There are some indications that active stabilzation was at least planned for the larger ships, too. Active stablization had been used on some earlier battle cruisers, and it is mentioned in the context of the new 15" artillery systems. It may take some further research to determine if it was indeed used, or not, on the larger ships. Stability was of great concern to the Germans. 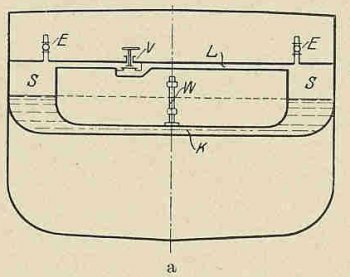 However, according to Schmalenbach the Frahm tanks on PG were almost useless and even counteractive, and making them into passive fuel tanks was the most logical thing to do, and fitting bilge keels aleviated the roll more effectively. From: Heinrich Evers, Kriegsschiffbau, Springer Verlag, Berlin 1943. 440. Roll Damping Tanks 1. Roll damping tanks were utilized for the first time in the old English citadel ship “Inflexible”, because her large meta-centric height, produced a very short roll periodicity, made damping mandatory. This consisted of rectangular water tanks arranged athwartships. In the German Navy such tanks were installed on the battle-cruiser “Derfflinger” (Fig. 264a), one small cruiser, torpedo boats, and submarines. In merchant ships, for example, they are used in the steamers of “Deutschland” class. The express steamer “Bremen” also has roll damping tanks (filled with fuel oil) installed, and the bilge keels are entirely omitted. Fig. 264a shows the older design installed in some ships, Fig. 264b shows the newer form for merchant ships – installed here with the so-called design-stabilizing bulges – and Fig. 264c shows a similar type for U boats. Fig. 264. Roll damping tanks of various constructions 2. Both of these designs are similar in principle. 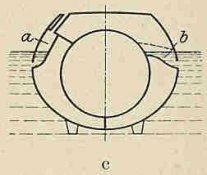 The roll damping tank represents a U tube [“communicating tube”] in which a certain mass of water can swing [shift]. The connection between the two vertical legs, in the older version, is a horizontal conduit; in the newer version this is formed by the external water level. The outboard slits in the newer design represent the transfer between connecting conduit and the vertical leg of the older version. where l represents half the length of the fluid column. The oscillation periods can be adjusted so that they are equal to the roll period of the ship. If one considers the wave oscillation, the oscillation of the ship, and that of the -water in the tank as an alternating, coupled oscillating system with friction and other forces, then this results in a phase shift of 90 degrees between the oscillating periods of the waves and the ship and a further phase shift of 90 degrees between the oscillating periods of the ship and the fluid column in the tank, overall totaling 180 degrees, i.e., the impulses of the roll damping tank water counteract the impulses of the waves. In the newer roll damping tanks the flooding of the water is regulated by a gyro-controlled compressor or pumps (active roll damping). 1: Hänert: Angewandte Mechanik (Applied Mechanics), p. 143. “PG possesses an active roll damping installation which operates according to the principle of communicating tubes . The installation consists of two lateral large cells [tanks] positioned in the aft third of section VII. The cells are connected at the bottom by a pipe for boiler feeder-water and on top with a pipe for air. A compressor pushes air into the port and then again into the starboard cell in such a manner that each time the water is pushed into the cell with the rising motion from the cell on the ship’s opposite side. With this the motion is braked or damped. The control of the compressor is initiated by a gyro that is independent of other gyro equipment (compass, artillery, torpedoes). - If the author seems to recall correctly, the equipment was operating only in the spirit for which it was designed, but it was not sufficiently powerful. Therefore, in the winter of 1940/41 a bilge keel was mounted on both sides of the hull and the rolling was immediately lessened, and, then the damping effects of the equipment became adequate. - In order to increase the cruising range – by one fifth! – the equipment was converted from boiler feed-water to fuel oil. Intentionally switched to the wrong setting, the equipment acts like a roll device, and it is used to exacerbate the conditions during gunnery practice. (Drawing 2. It shows the layout of the generator compartment, turbine 2/3, boiler 1, radio compartment B and anti-roll compartment at 1:200)” From Paul Schmalenbach: Schwerer Kreuzer Prinz Eugen: Tatsachen Bericht, ISBN 3-453-01494-4, pp. 76-77, Wilhelm Heyne Verlag, 1982. I have to disagree that Bismarck's designers were not aware of roll accelerations and their effects on gunnery. Especially considering that accounts describe her as very stable, not just good. And I also dont believe that they couldent tell the difference between accelartions or stability. Was everything considered when they deduced that her accelerations were rapid? For instance was the fact that Bismarck carried alot of weight in her belts considered in their roll accelration equations.. And that they were situated on the the extreme ends of a broad ship. Im sure everyone one would agree that moveing a large weight rapidly takes alot of energy. This weight would definitely have a dampening effect on roll behavior. Also what of the effect of bilge keels. Giving the Bismarck first excellent stability then tame roll accelerations with bilge keels. Get the best of both worlds and have an excellent gun platform. Which I might add Bismarck was. Remember also she rolled only 3 degrees in extreme turns ( her turning radius was also excellent ). And that the crew regarded her as very steady(high roll accelrations would be felt and no one seems to have complained about it). It would seem to me that she was outstanding in this regard.